I wanted to share this little idea with you while we still have a couple of weeks till Halloween. While there's no way I'd sew enough for all the trick or treaters, these little treats would be fun for a child to bring to school and share. I cut out some Halloween shapes. Then I stitched around the edge, leaving a small space open. I stuffed it full of candy corns. Then I added googley eyes. They were super easy to make. It'd be great practice if you're just learning to sew. Oh, and in other news....yesterday Kim from Today's Creative Blog featured my blog. I was really excited. I always wanted to be featured on her site. You can see the feature HERE. Tomorrow my mom is releasing a new pattern that I think you'll love. And, this time it's for the girls. See you then. Thanks for reading. oh I really have wanted to make these. How fun to try them in other holidays! Love this! So fun. Thanks for sharing! Cute! I love that you can create them for any holiday! Thanks for sharing. I still haven't tried sewing paper but I love the look! That is so great, I agree it's also a good idea for a kids' birthday party as a Give away. These are Tiggeriffic~! They look so easy and so fun~! My grandchildren live in Illinois and what a great thing to make for them for Halloween. So funny, I just pinned this, then went to read my daily's (what my husband and I call the blogs we read...daily...Umm, I just realized I probably didn't need to explain that...) and here was your post! Great minds must think alike. Ha ha. I love this idea! It is so simple, but something the kids would just go ga-ga over! 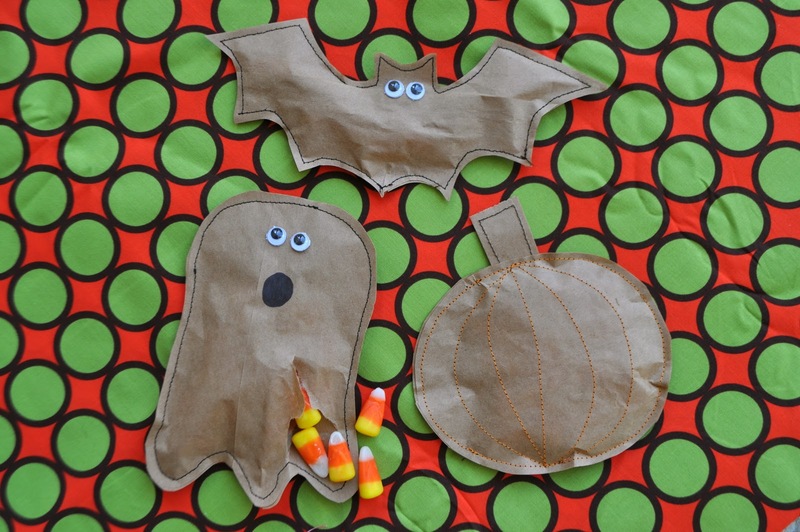 I have got the googly eyes and am all set to make some for halloween, with the paper bags I already have. By the way, this post totally inspired me to make something similar, for Family Home Evening refreshments. We watched some of the All Blacks rugby game for FHE. For treats, I put their lollies in sewn paper bags, except I printed the All Blacks logo on the paper pag, and then sewed around it. I took some photos, so it will be on my blog at some stage. I made gingerbread men same way one year but just stuffed them with batting then sent through mail and they went just fine. Wonder if you used thickest paper and maybe put candy in a baggie first if they would mail. It costs extra to mail it this way but love sending odd things through the mail. Like drink bottles filled eith goodies, flip flops, frisbies, a coconut from hawaii years ago! Is it REALLY made of paper! ?